Reigning from 1890-1948, Queen Wilhelmina ruled the Netherlands longer than any other Dutch monarch, including through both World Wars and the Great Depression. Outside the Netherlands she is primarily remembered as an inspiration to the Dutch resistance during World War II. In her own country, Wilhelmina was a symbol of national unity. The reverse (back) of the Netherlands 10 Guilder depicts a crowned lion bearing a sword and arrows on a large shield capped with a crown, surrounded by the denomination "10 G". The words "KONINGRIJK DER NEDERLANDEN" and the date encircle these images. This Dutch coin also features a seahorse and caduceus (a winged staff with two entwined snakes) on each side of the date, respectively. 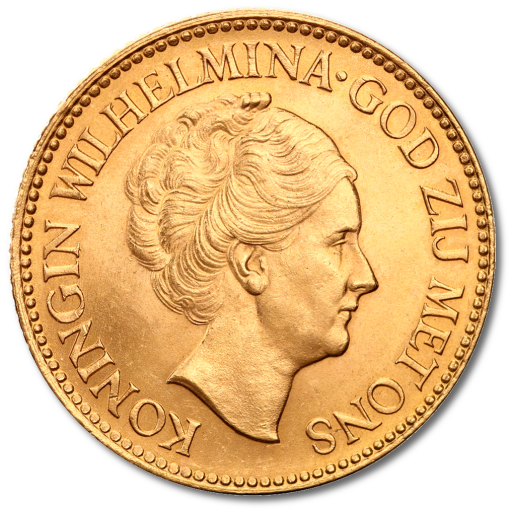 The obverse (front) features Queen Wilhelmina, who ruled the Netherlands from 1890-1948, surrounded by the words "KONINGIN WILHELMINA • GOD ZIJ MET ONS". These coins were produced in two separate series with slightly different design versions. The first series features a portrait of the Queen with draped shoulders and wearing a tiara. The second series also displays a portrait of Queen Wilhelmina, but on a slightly smaller scale. She is truncated at the neck and is without the tiara. The reverse is identical in both series. 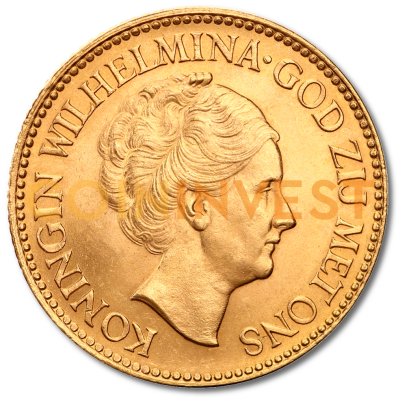 The two Dutch productions of 10 Guilder coins featuring Queen Wilhelmina ran during select dates from 1911 to 1917 and 1925 to 1933. Other than slight design changes to the front, or obverse, these gold coins carry the same specifications, including size, weight, and composition (90% pure gold). Fantastic!. The dutch guilder is a beautiful historical coin. In the Netherlands this is the most famous coin and the best coin you can get! in my opinion a must have!